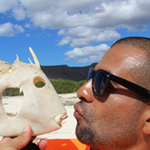 Based in La Paz in Mexico’s Baja Peninsula, Pedro has been coming to the island of Espiritu Santo for years. He also guides a number of walks here introducing the flora and fauna of this generally uninhabited island. He’s also great at spotting seals. Pedro has been skippering for SwimTrek in the Baja since 2010.